Brigadier General "Mad" Anthony Wayne, leading the advance forces of Major General Marquis de Lafayette, was ambushed near the plantation by the British army in the last major land battle of the Virginia campaign prior to the Siege of Yorktown. Following a month of marching and countermarching in central Virginia by Lieutenant General Charles Cornwallis and Lafayette, Cornwallis in late June moved to Williamsburg, where he received orders to move to Portsmouth and send some of his army to New York City. Lafayette followed Cornwallis fairly closely, emboldened by the arrival of reinforcements to consider making attacks on the British force. 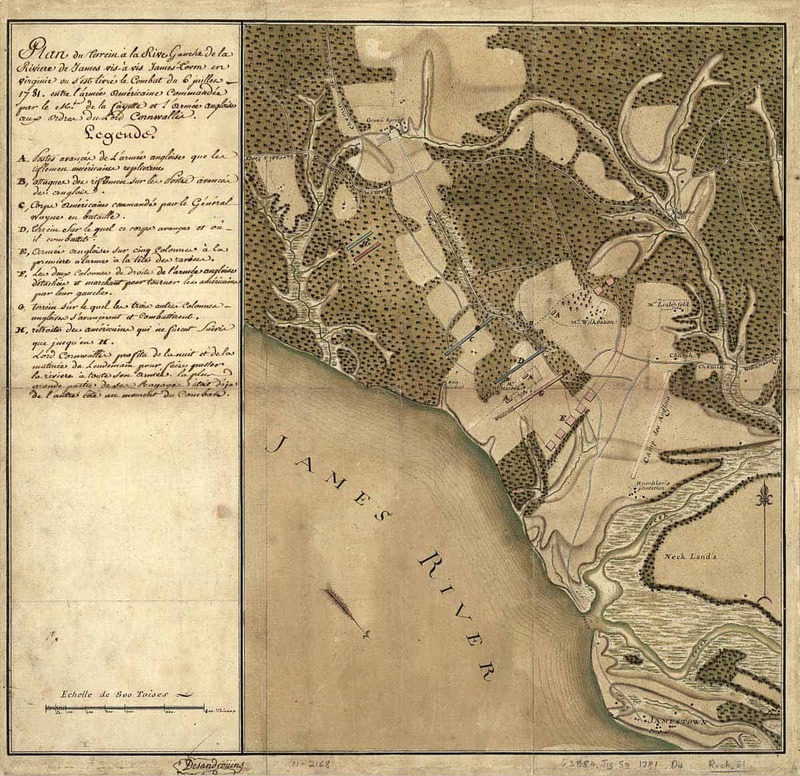 On July 4, Cornwallis departed Williamsburg for Jamestown, planning to cross the James River en route to Portsmouth. Lafayette believed he could stage an attack on Cornwallis's rear guard during the crossing. On July 6, Cornwallis anticipated Lafayette's idea, and laid an elaborate trap. 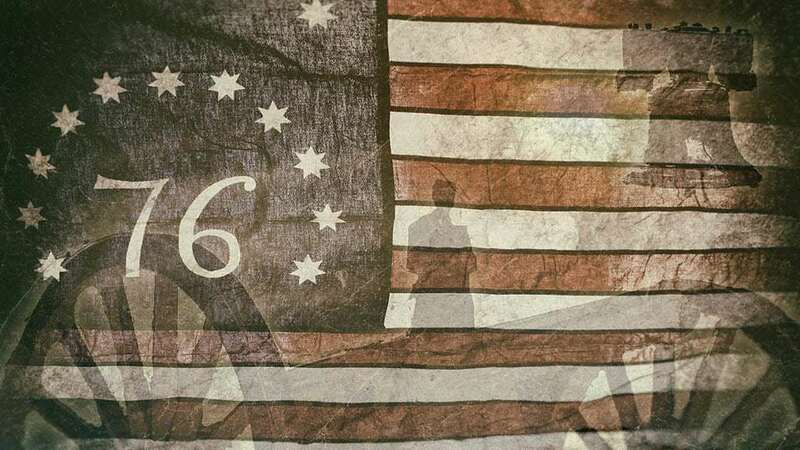 Gen. Wayne's forces were very nearly caught in the trap, and only a bold bayonet charge against the numerically overwhelming British enabled his forces to retreat. Cornwallis did not follow the victory with pursuit, instead following his plan to cross the river. The action reinforced the perception among contemporaries that justified the moniker "Mad" to describe Wayne, although opinion on the merits of his actions was divided. Armies - American Forces was commanded by Gen. "Mad" Anthony Wayne and consisted of about 800 Soldiers. British Forces was commanded by Gen. Charles Cornwallis and consisted of about 5,000 Soldiers. Casualties - American casualties were estimated to be 28 killed and 122 wounded. British casualties was approximately 75 killed/wounded. Outcome - The result of the battle was a British victory. The battle was part of the Yorktown Campaign 1781. The position where Cornwallis hid his army was well-chosen. To the left, impassable swampy terrain sloped down toward the river. To the right, there was more marshy ground and a few ponds. The access from the rest of the mainland toward the ferry was via a 400-yard causeway from the Green Spring Plantation that was surrounded by marshlands that an advancing army would have to negotiate. Cornwallis arranged his army in two lines, with the 76th and 80th regiments along with part of the 43rd and Lieutenant Colonel Banastre Tarleton's British Legion on the left, and the Brigade of Guards, and Hessian auxiliaries on the right. Both wings also included light infantry companies. Cornwallis left a small company of German jägers and a few men from the Legion to give the appearance of a rear guard picket, and gave them specific orders to resist the American advance as much as possible. On July 6, Wayne led Lafayette's advance company, about 500 men, out early from Norrell's Tavern. When Wayne reached Green Spring, he surveyed the terrain and noted the presence of the British guards. When Lafayette came up with his main force, the two men decided to go ahead with the attack, but Lafayette ordered more troops forward from Norrell's Tavern around 1:00 PM. Some minor skirmishing took place while they awaited these troops. Wayne's 500 soldiers included 200 Virginia riflemen under Majors John Willis and Richard Call backed by additional light infantry led by John Francis Mercer, William Galvan, and McPherson. Colonel Walter Stewart's Pennsylvania Continental battalion formed the reserve. Lafayette sent forward two Pennsylvania Continental battalions under Colonels Richard Butler and Richard Humpton, and Major John P. Wyllys' light infantry battalion. Beginning to suspect something was amiss, Lafayette held back the light infantry battalions of Colonels Francis Barber and Joseph Vose. The three-battalion reinforcement increased the size of the force Wayne ordered into the swamps around 3:00 PM to between 800-900 men. Wayne's force now consisted of two companies of riflemen, one of dragoons, and most of the Pennsylvania Line, and included three pieces of field artillery. As they moved out, Lafayette rode out toward a spit of land on the riverbank from which he might observe the action. The Virginia campaign of 1781 was one of disappointment for Cornwallis. His advance into Virginia in May, left British forces in the Carolinas weak and on the defensive. And his efforts to subdue Virginia by engaging the continental forces under Lafayette proved fruitless. While British activities in Virginia did disrupt that state's war effort, Cornwallis had failed to score a decisive victory. And now, as July approached, orders from General Henry Clinton to send 6 regiments to New York and establish a naval base with his remaining force made the likelihood of achieving such a victory even more remote. 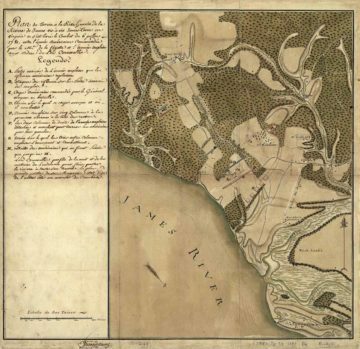 Abandoning Williamsburg in early July, Cornwallis made preparations to cross the James River just north of Jamestown Island. His destination was Portsmouth, but before he sent his army across the river, he tried one last time to draw Lafayette into a major engagement. Concealing the bulk of his force along the shore, Cornwallis hoped to convince Lafayette that only a rearguard remained north of the James. To strengthen the ruse, two "deserters" were sent to the American lines reporting that most of the British army had indeed already crossed the river. Lafayette, seizing his own opportunity to deliver a decisive stroke, sent Wayne forward with a force of dragoons, riflemen, and light infantry. Numbering around five hundred, they skirmished all afternoon with the British, slowly but steadily forcing them back to the river. 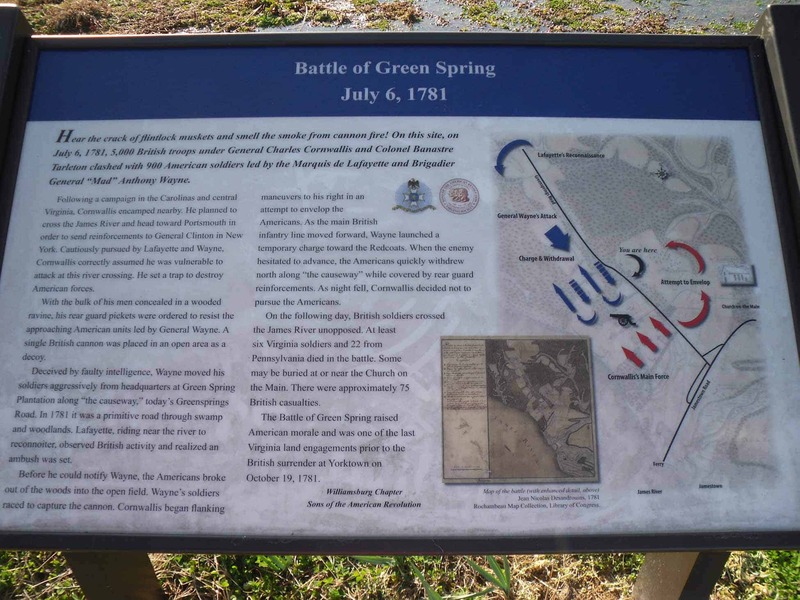 Around 5:00 P.M., the rest of the American army arrived at Green Spring, now about a mile from the fighting. Lafayette, growing more and more suspicious and cautious, sent only a portion of these reinforcements to join Wayne. He then rode to the river where a tongue of land enabled him to see the true strength of the British force. Although he had discovered the trap, Lafayette was unable to withdraw his forces before the trap was sprung. For as he hurriedly rode back to break off the engagement, Wayne's troops advanced towards the trap's trigger, an abandoned British cannon. that Cornwallis had left in the road. Their seizure of the gun was the signal for the British counterattack, which began with a barrage of canister and grape shot, and was followed by an infantry charge. At that point, according to Lafayette, the "whole British army came out and advanced to the thin wood occupied by General Wayne." Lafayette, from his vantage point on the river, had spotted the main British force and realized that Wayne was entering a trap. However, he was not able to reach Wayne in time to recall him. He immediately began moving additional troops forward in an attempt to prevent the trap from closing on Wayne. In the meantime, the British charge had thrown the Americans into some confusion, and Wayne was concerned that a retreat would turn into a disorderly rout. He reformed his line, ordered his artillery to fire a blast of grape shot, and then had the line charge the numerically overwhelming British with bayonets fixed. Wayne's reaction to the crisis was unconventional. Outnumbered by a nearly 3-to-1 margain, he ordered his small force to advance upon the enemy. According to Tarleton, "the conflict in this quarter was severe and well contested. The artillery and infantry or each army, in the presence of their respective generals, were for some time warmly engaged not fifty yards asunder." Wayne's audacious charge worked; it successfully halted the British advance long enough for Lafayette's covering force to approach. Lafayette rode forward to assist in managing the American retreat, which began to crumble after Cornwallis personally led a counter-charge. Wayne's men, against heavy numbers, made a brave fight. 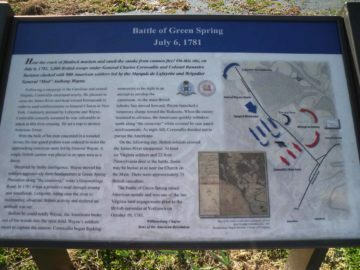 However, "the right of the enemy's line, having nothing but the retreating riflemen and advance parties before it, threatened to envelop the Americans; and with the pressure on their front increasing, they abandoned the field and retreated rapidly...to Green Spring." Cornwallis, satisfied with the victory, did not to pursue the retreating Americans, and instead crossed the James River as planned and moved on to Portsmouth. There his arrangements to embark troops were countermanded by new orders from Clinton that instead ordered him to use his force to establish a fortified naval station. This Cornwallis chose to do at Yorktown, where he was compelled to surrender after a brief siege in October 1781. Lafayette, in his dispatches and reports throughout the later stages of the Virginia campaign, painted Cornwallis's movements to Williamsburg and Portsmouth as a retreat. These reports bolstered Lafayette's reputation, and the battle, although a tactical setback, did not harm that reputation. Wayne wrote of his decision to charge the full British force that it was "one of those prudent, tho' daring manoeuvers which seldom fail of producing the desired effect; the result in this Instance fully Justified it." Lafayette publicly lauded Wayne's performance, but recorded privately that Wayne made tactical mistakes and the battle read well "in a gazette". Militia general Peter Muhlenberg blamed the loss on "the impetuosity of our brother Brigadier." Wayne biographer Paul Nelson opines that Americans of the day could "hardly decide after the battle whether to admire Wayne for his brave and impetuous character or to condemn him as a foolhardy adventurer."